The space available for storing thrift store finds is becoming quite limited now. Thankfully most of the things are smallish so I think I have room for two more months of collecting then spring had better arrive or even the paths thru the rooms will be filled in. 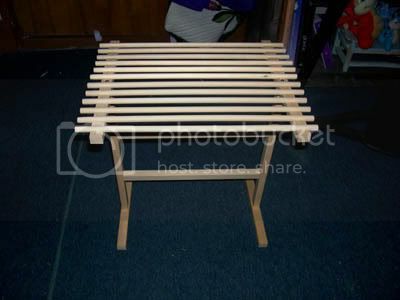 Adorable table that will go out on the front porch area when I rearrange things out there. The obelisk will remain in parts in the box until spring, this one is like the second from the left, I am thinking it would be perfect for a Morning Glory vine. The bottomless birdhouse will become a plant protector to keep squirrels from digging it up. 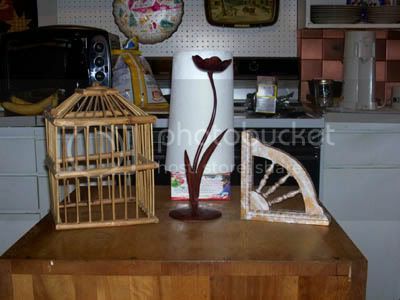 I also have been collecting several wire basket type things to use in the same way. The flower thing in the middle is a candle holder but I think it will look good just sitting out in the garden somewhere. And the fancy bracket thing was only 50 cents and I know I can find someplace for it someday. 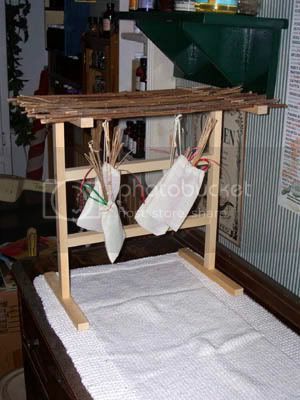 To a non-gardener this would appear to be a pasta drying rack. I have a couple of other things but I think they each need their own blog entry. 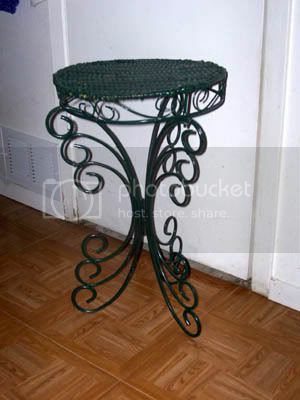 You really have a great eye for all kinds of goodies.I love the little table.I have a bird house with the bottom that was left at an old house that Richie's mom and dad purchaced near here .It will hold a nice size ivy.I love all you found toni can't wait till spring to see the pictures . Toni you continue to amaze and inspire jealousy at the same time. The rack is a great creation and I also really like the birdhouse. Your herb rack is an act of genius! Being able to see that one thing can be another is real talent. 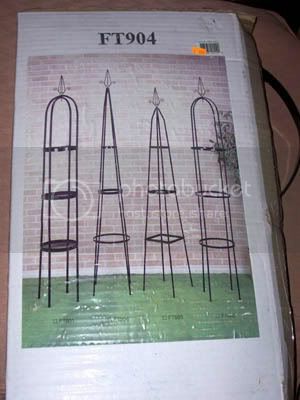 I also have a couple of obelisks in the garden exactly the same as the one you've just bought - mine are green. I have a climbing rose on one and a clematis on the other. I love the herb drier. Gosh you really have a great eye for bargains. How I wish our thrift shops sold things as good as yours do. Great going Toni, love them all, can't wait to see what you do with them. Toni I love all your finds especially your herb drier!! What a great idea!! I adore an obelisk. I have a wood one we made but I would love a metal one too. Great finds. That's the excitement of the thrift store for ya, ya never know what great thing is going to be there.